We've certainly had our share of cheesecakes. Everything from the ridiculous to the somewhat sublime. 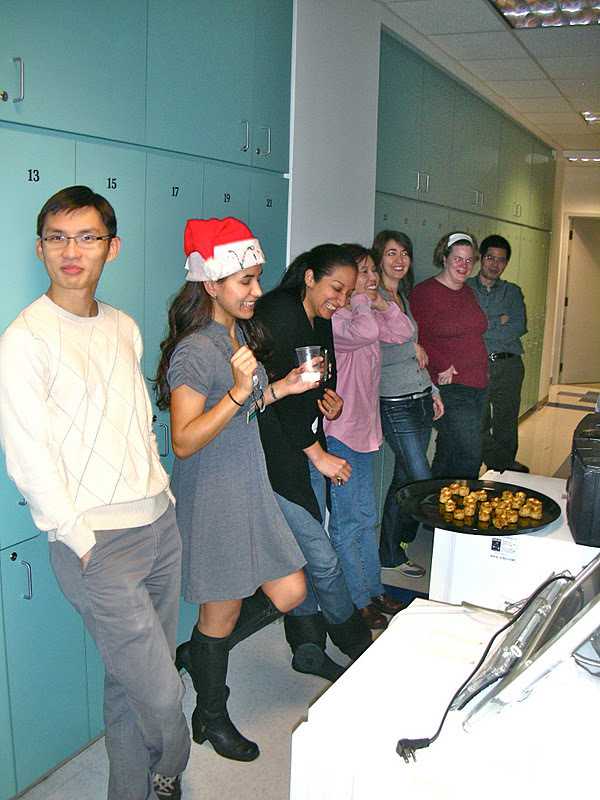 Some of our colleagues have been particular fans of them and brought them in repeatedly. There is a general consensus, however, that they tend to be on the heavier side and not everyone is a big fan. 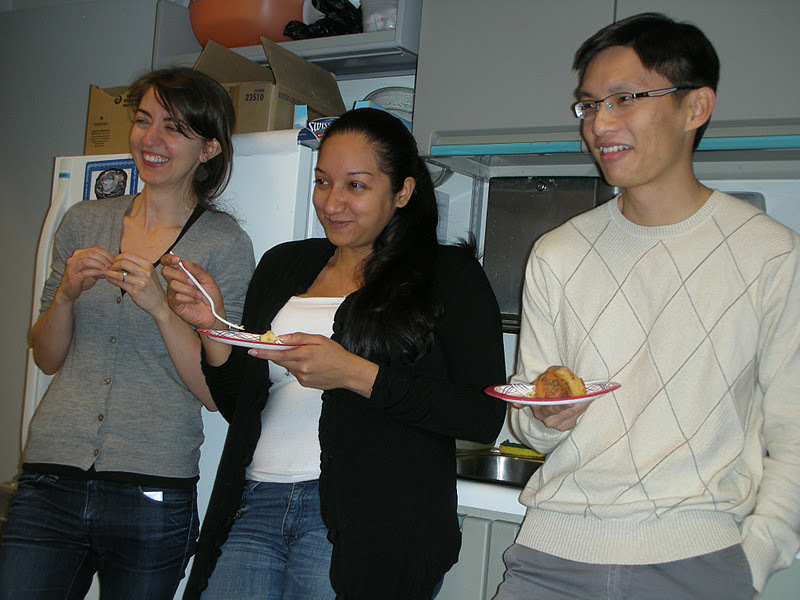 But we eat them nonetheless and do not discourage anyone from bringing one in. 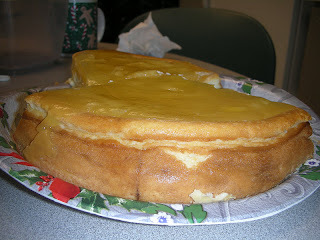 Mom's Cheesecake - or half of it that is! For Christmas Eve celebration this year one of our mother's brought her signature cheesecake. After having pigged out on appetizers and piles of pasts there were not too many takers for dessert let alone cheesecake. Since the family hosts were going to he laden with plenty of other sweets they were offering up items to anyone who wanted to take something home. 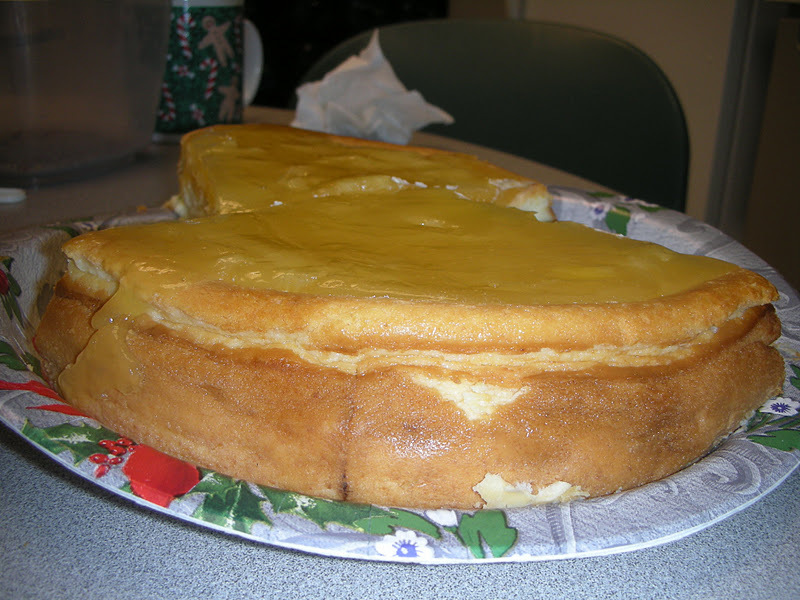 So it was decided to take some of the cheesecake. Some ended up being half the cake. Imagining that it was not going to disappear to quickly at home I figured what better place to bring it to than cake hour. Looks heavier than it really is! 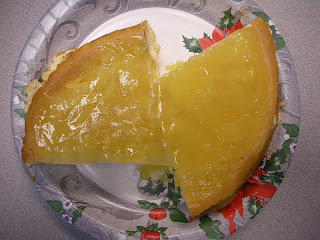 As it turns out Mom's makes a good cheesecake! 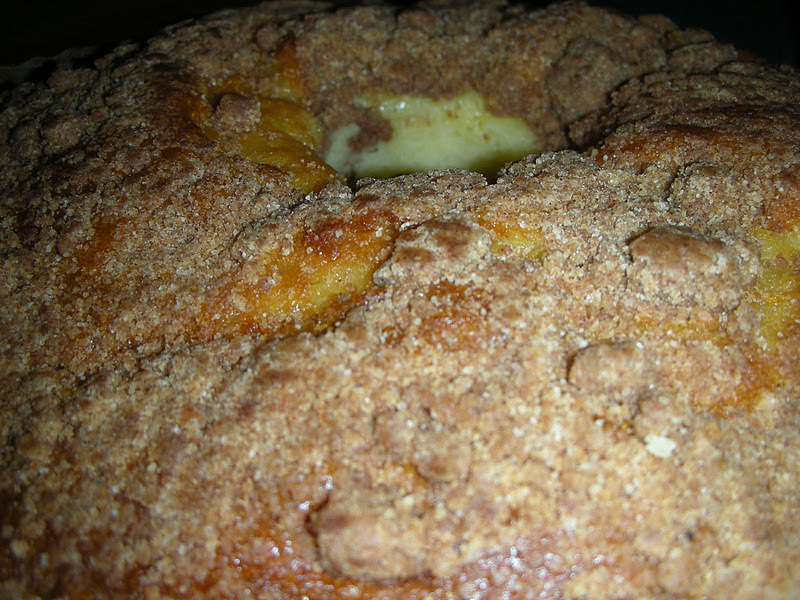 Firstly, it does make a difference that one is baked for you at home. Most of the commercial one hardly seem like they are baked but rather poured into a form on top of some kind of cracker or cookie crust. 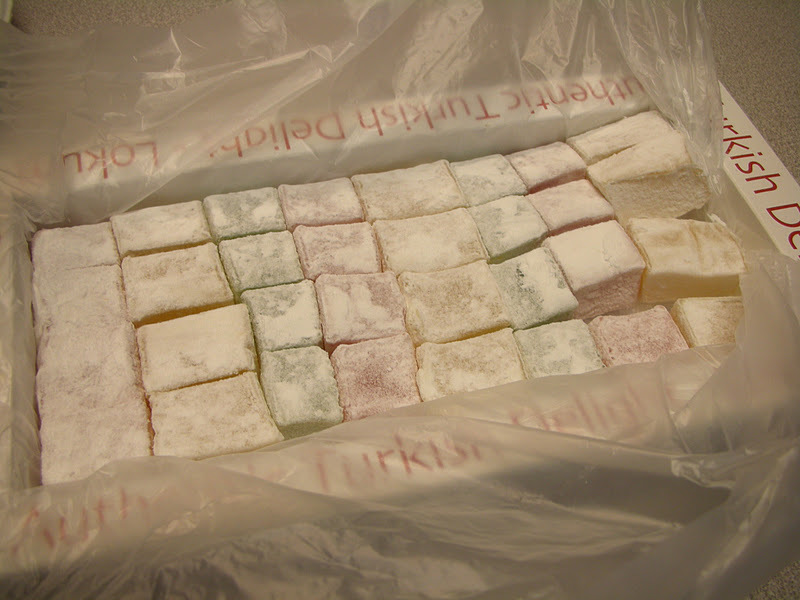 There was also none of the sharpness to the taste that you can sometimes get and it was a lighter, less sweet and considerably less dense than most that we have had. This might be due to eggs being in the batter. Plenty of unsweetened fruit to top it off! 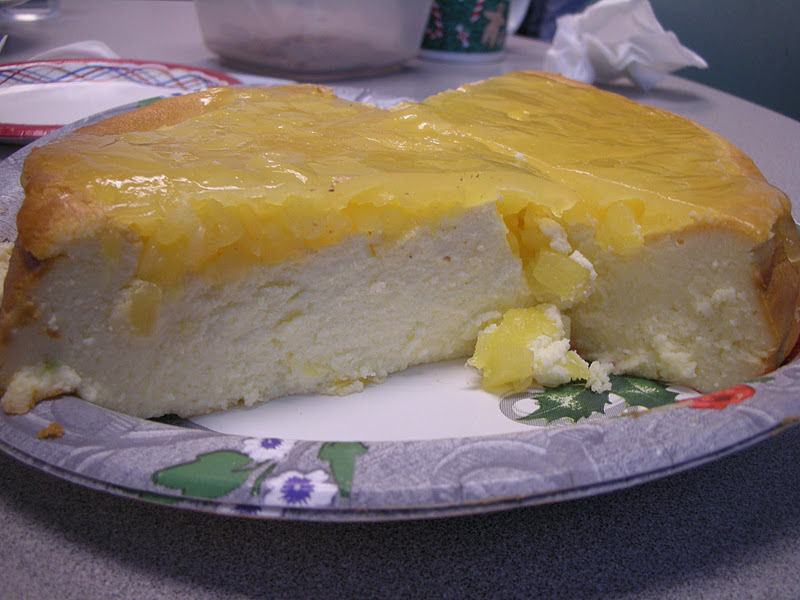 Mom usually tops her cheesecakes with some kind of fruit - albeit canned - and in this case it was unsweetened pineapple. It was a good choice and contributed to the sense that this was not over sweetened. 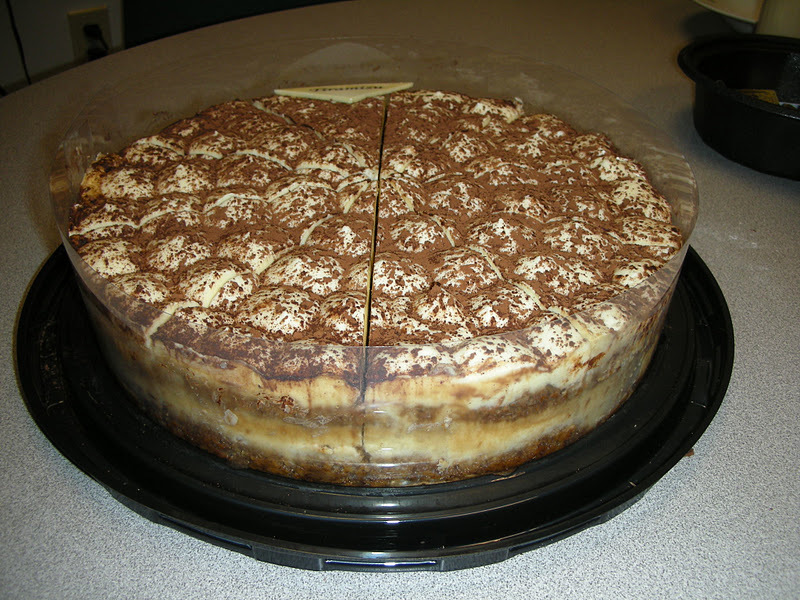 The bottom line is this was very well received and most felt it was one of the better cheesecakes we have had. Even some cheesecake naysayers were happily surprised. From my own standpoint, after all these years of thinking I didn't want to have anything so rich and heavy, I'll no be less reluctant to chow down when one of these turns up at another family function! Thanks, Mother! Our colleague from New Jersey with roots in Colombia - or is it Peru - refreshed our memories by bringing in again some Natilla that hee mother had made. 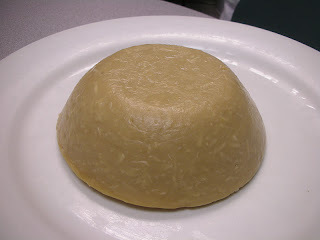 This is the coconut custard type thing that is made around the holidays that is a specialty of the aforementioned countries. It is very good, gluten free, and has a hint of clove in the taste because there is a small amount of whole cloves included in the recipe. As was the case with the last time we were treated to this it was a very firm and not too sweet Natilla with adequate coconut. The only issue is that once again there were no bunuelos. These are fritter type things that are supposed to be served with the Natilla. Last year our Natilla bringer claimed her brother had eaten them all but this year we don't know what the excuse for not having them was. 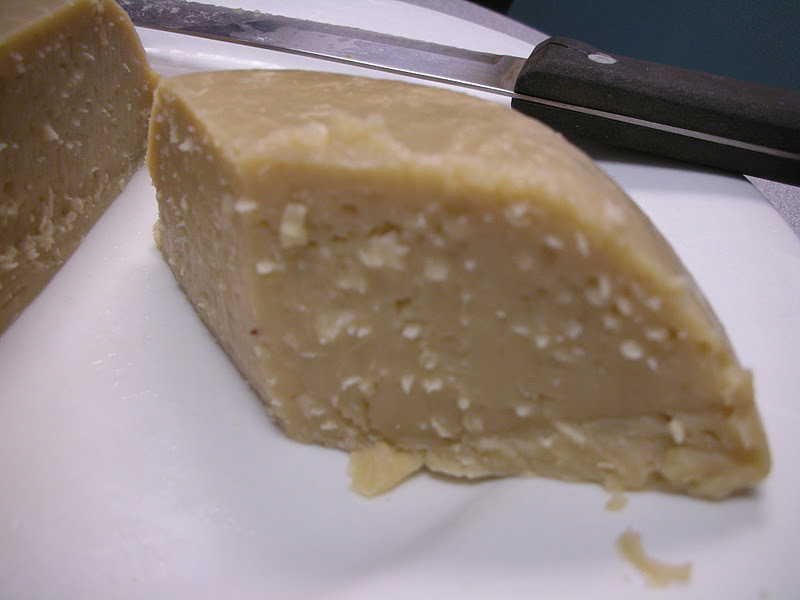 In either case we continue to be deprived of the full Natilla experience. 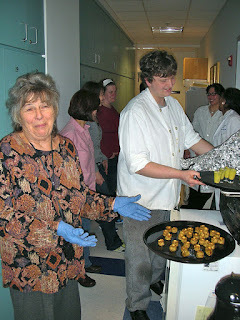 We may have to have someone step in to get those bunuelos. 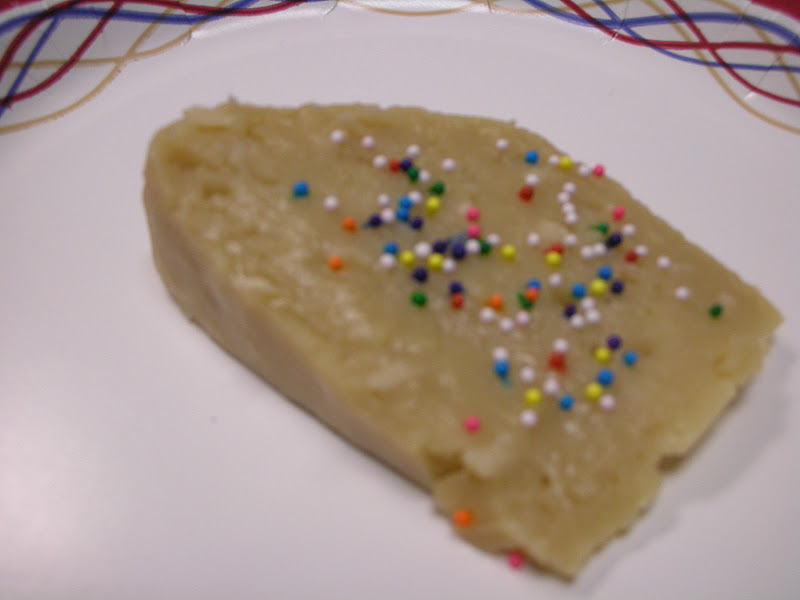 In the absence of the complements for the Natilla we decided to vary it up a bit by adding colored sprinkles to the pieces. Our Natilla lady was not amused. Its' traditional Colombian Chirstmas Goop aka Natilla...AGAIN! Natilla as we have come to know it! Lots of coconut and gluten free! What's wrong with a little color? 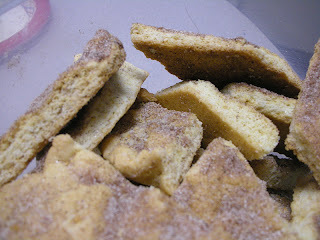 But even though we did not get the bunuelos we did have other things to go with the Natilla. Our French colleague had brought in an Alsatian treat that HER mother had made. 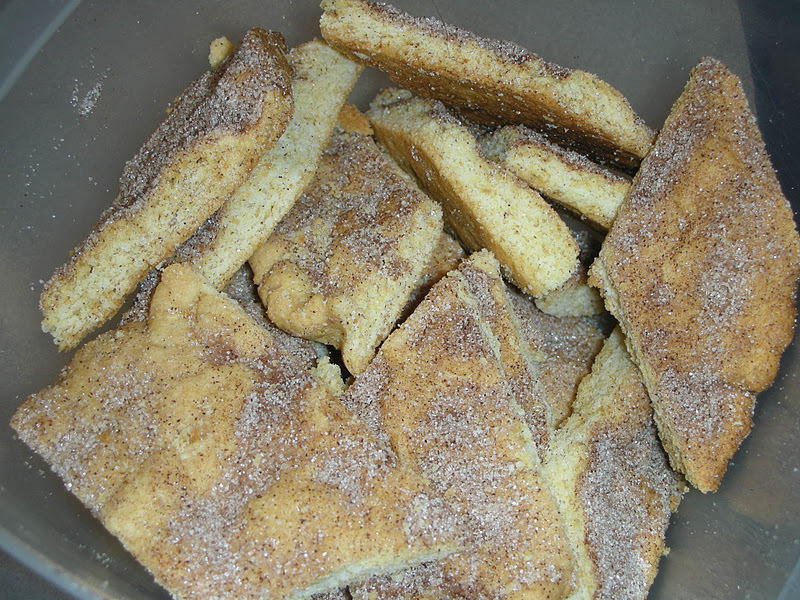 This is called Tzemet Kuch or in French - Petits biscuits alsaciens à la cannelle. 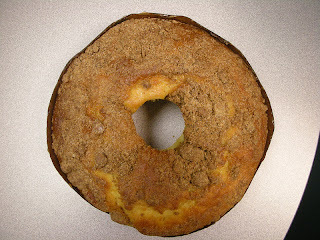 In German from which the Alsatian dialect stems from it is called Zimtkuchen or cinammon cake. There are very many versions. This particular one consisted of a hard flat dough baked and topped with a cinnamon sugar. 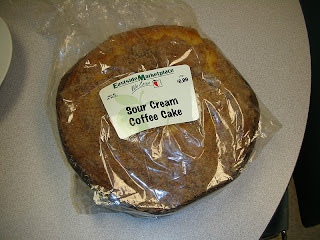 It had a cookie like texture but was very good! 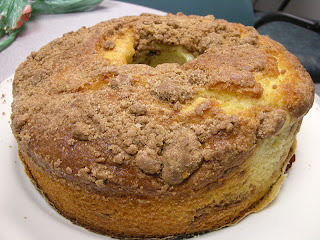 A lot of Zimtkuchen are more like a coffee cakes but we liked this kind! 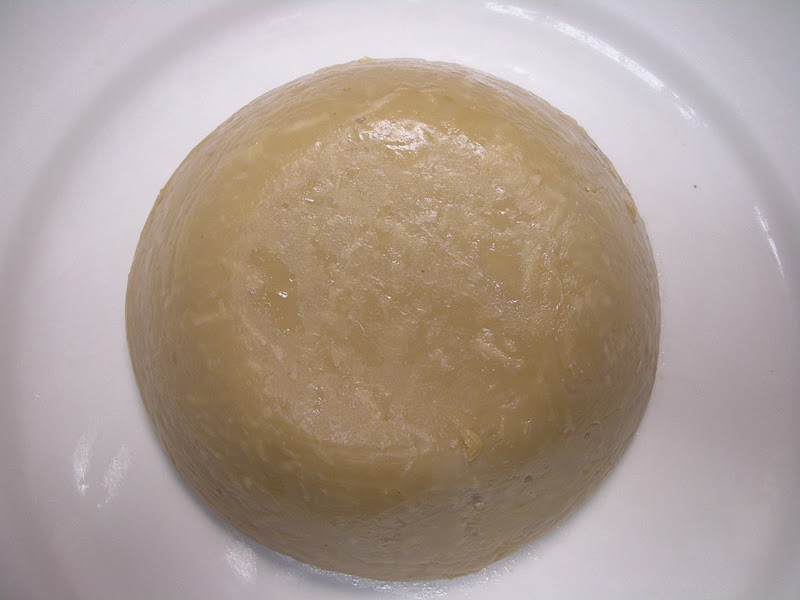 Alsatian Tzemet Kuch from grandmother's recipe! These were the flat and crispy kind! The recipe stems from the grandmother who passed it down to the mother who passed it down to our French colleague who lost it. But Mom just gave it to her again so she won't have to wait for Maman's next visit from France. During the recent visit that yielded the Tzemet Kuch our French colleagues and family were seen on TV strolling about the State House in Providence during one of the asinine Fox news reports about embattled Christmas. They enjoyed seeing themselves on TV. Check it out and see if you can figure out when they see themselves. 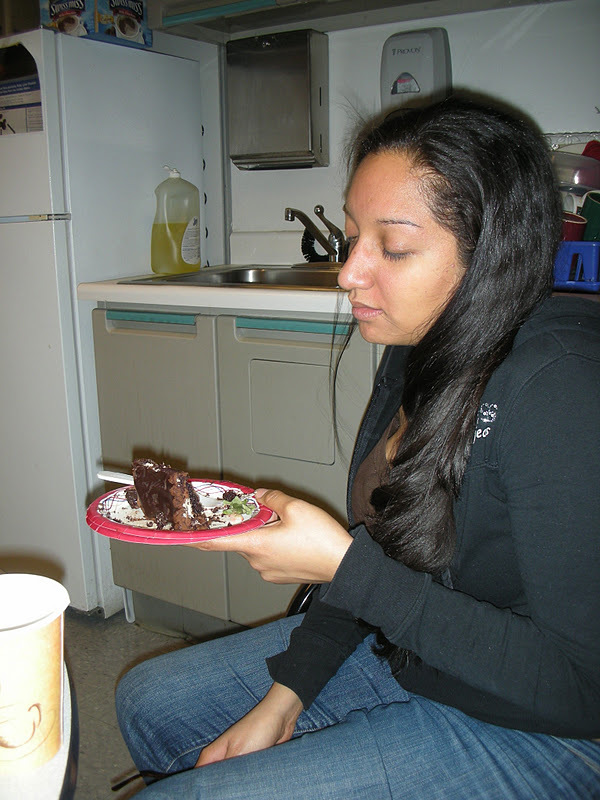 As if the Natilla and the Tzemet Kuch were not enough we also got to sample a flourless chocolate cake. 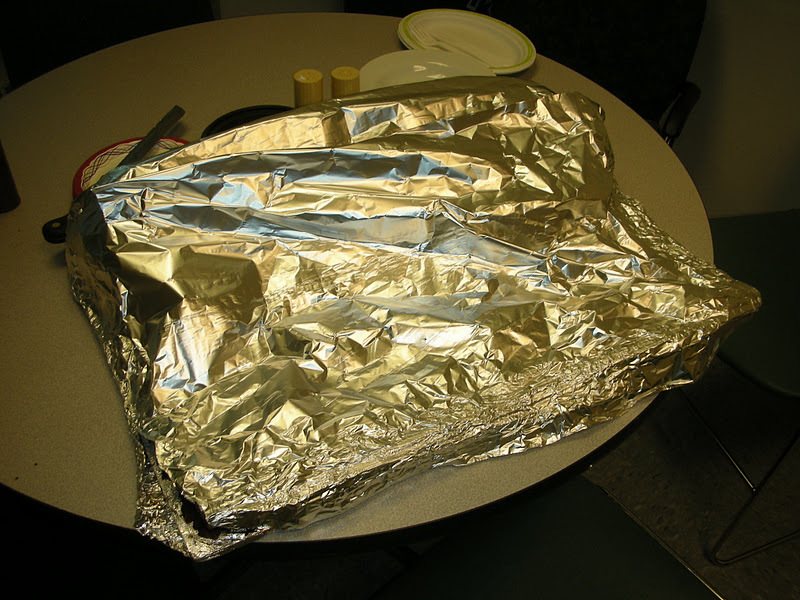 This has been baked for a Holiday celebration for the enjoyment of those with gluten sensitivities. That does not apply to most of us but we were happy to oblige. 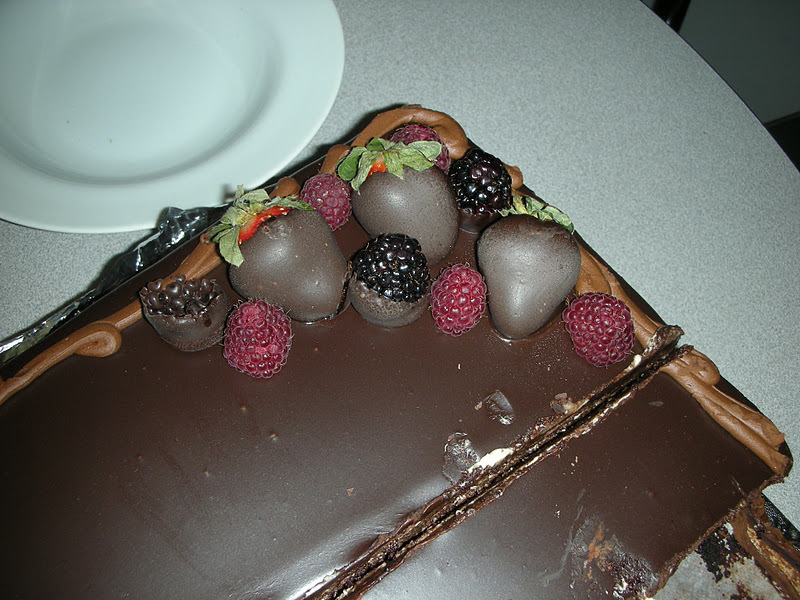 It was very chocolatey and delicious. In the absence of flour as you could imagine it was very dense! And a flourless chocolate cake to boot! Who needs bunuelos! 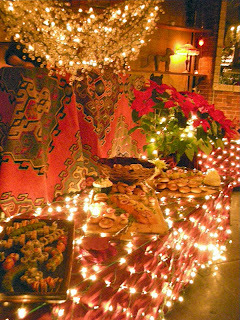 Between the Tzemet Kuch and the chocolate cake we almost didn't notice the absence of the bunuelos....ALMOST! 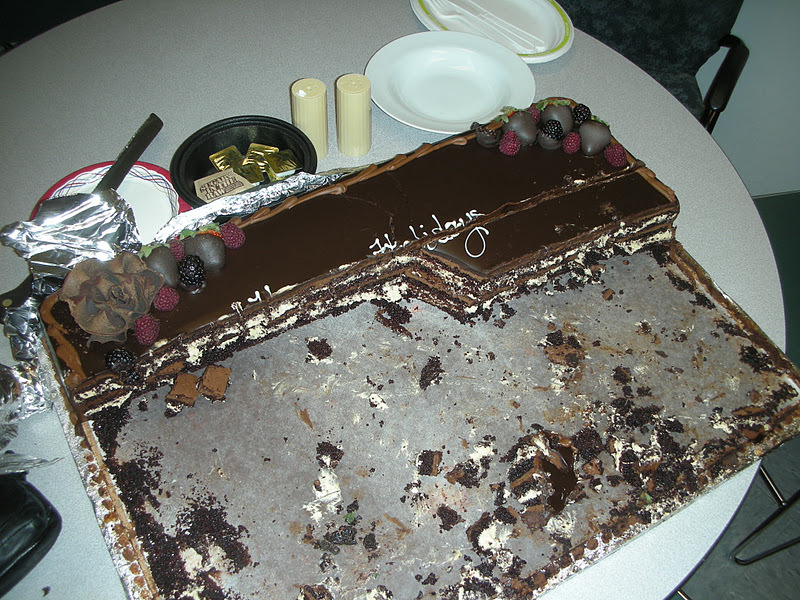 We had planned a usual type cake experience for today when something unexpected happened. We had our holiday party last weekend at the CAV restaurant in Providence, RI. CAV is an exceptional restaurant and it has produced a stunning holiday part for us for the last ten years or so. One the menu of passed appetizers were mini crab cakes and shots of butternut squash soup. 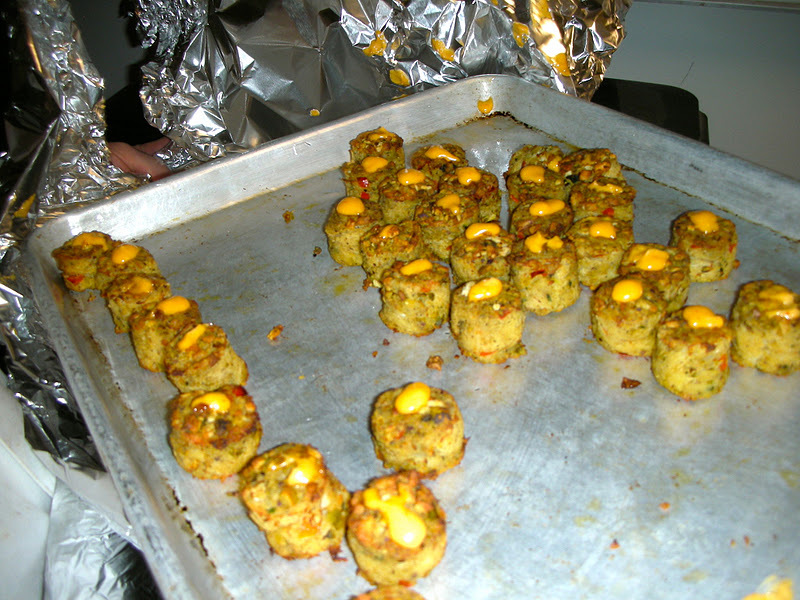 CAV is known for its crab cakes and indeed their recipe was named the best in Rhode Island. The recipe calls for jumbo lump crab meat and it is finished with pistachios and a spicy remoulade. Well as it turns out one of the attendees commented to the restaurateur that she did not get any of the crab cakes or the butternut squash soup. Since the restaurant owner wanted to be accommodating she offered to bring some over at some point. Once word of this got around everyone started commenting somewhat jokingly that they didn't get any crab cakes either. 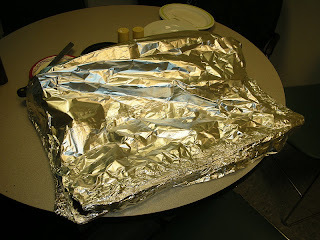 So when I called to say they could bring the food over for those that got left out I mentioned that now everybody was claiming they did not get the goodies. The restaurant owner insisted she could only bring them over to those who missed out and could not do it for everybody. I, of course, told her that I was joking. SURPRISE! An hour later she shows up with a tray full of the mini crab cakes and a pitcher of the soup. Contrary to what she said she did bring enough for everyone so as a prelude to cake hour we had a delicious crab cake hour. If you are in Providence and looking for dinner, you can't go wrong with CAV so go there and get the crab cakes! Hanging around hoping for more! 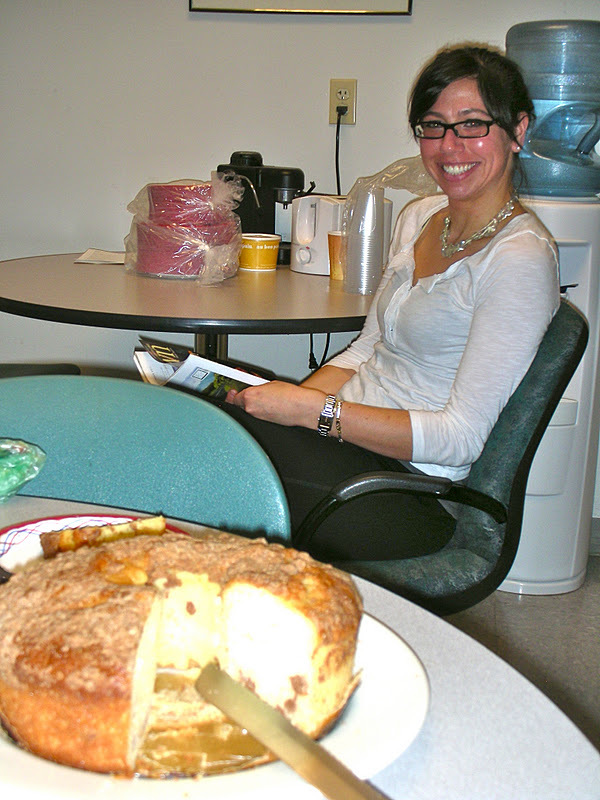 One half hour later it was regular cake time and a colleague who was celebrating a birthday brought in one of those classic sour cream coffee cakes from the East Side market. Always most, and good with lots of cinnamon this was a nice finish to the day though many of us were feeling full from those other cakes. Many people attended both sessions especially since a lot of them are off for the holidays as of today. We got a little introduction to Arabic music from our Lebanese associate though the simultaneous translation to the song that was being sung was a little off. Actually the whole thing was little off. 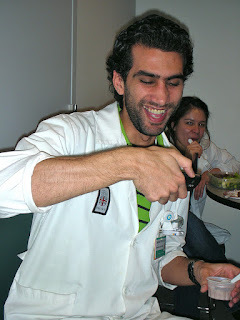 We also sang the obligatory "Happy Birthday" to our colleague. 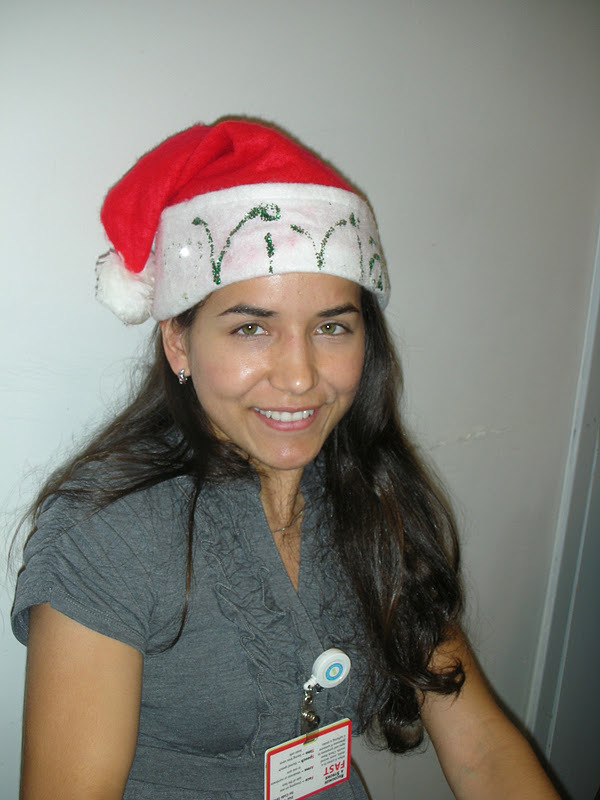 Nice way to get the holidays! Don't you like the Arabic singer? We'll stick with the cake! 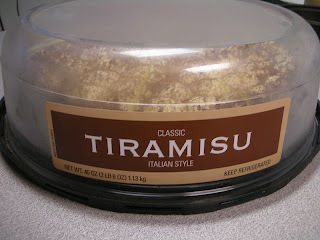 Over the year's we have been spoiled here in the Tiramisu department. 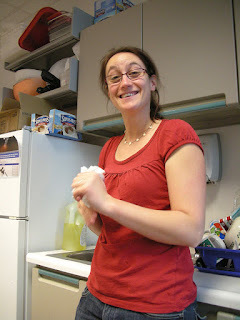 One of our colleagues from Italy paradoxically loves to make it though she doesn't really eat it. All the more for us as they say. 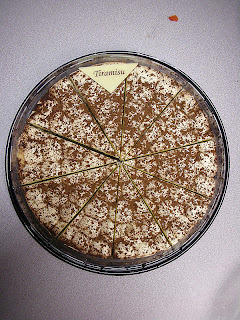 She does a very good job and there are several previous posts attesting to her product and even those of people to whom she gave the recipe - "Mongolian Tiramisu". 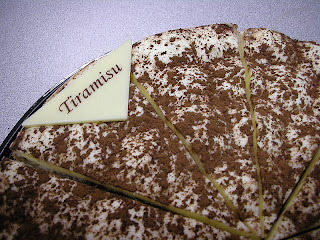 We even had a Tiramisu off where an upstart student thought he could best the master. Instead he went down. 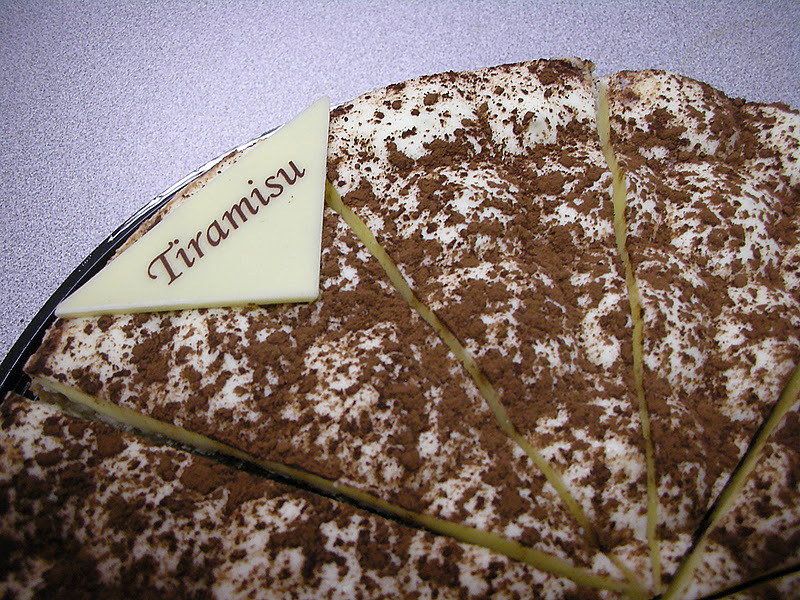 So it's always a little gutsy when someone brings in a Tiramisu. 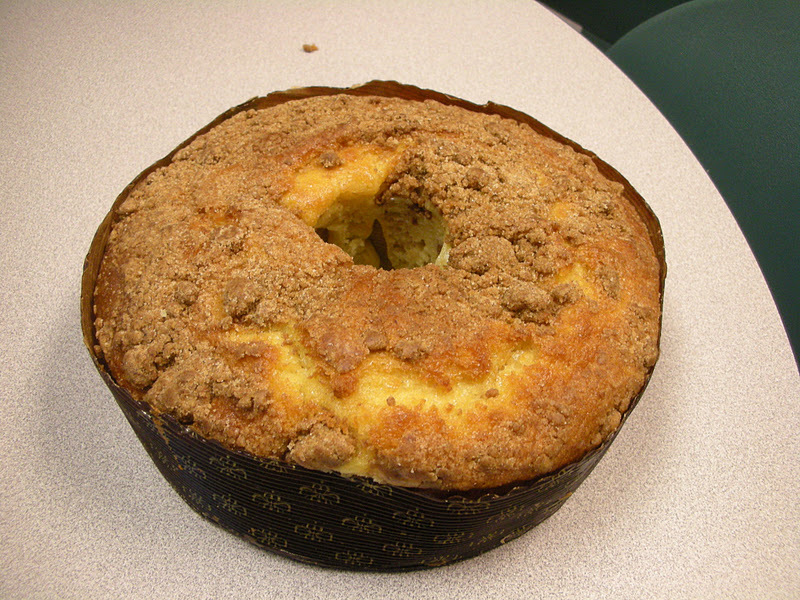 Many of the local bakeries do a good job but we remain true to our colleague's superior recipe. 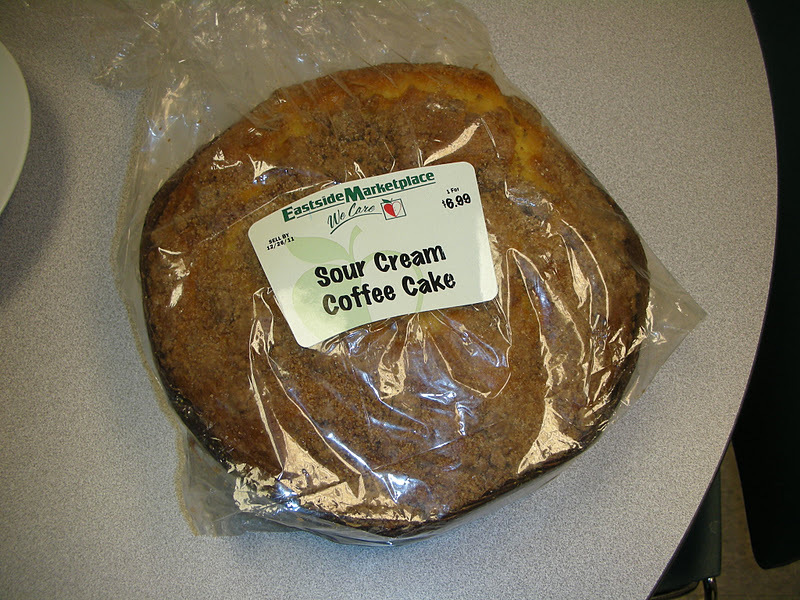 Nonetheless we had one today from The Eastside Marketplace we believe. This was round in almost like a cake format. There was plenty of Mascarpone cheese and an ample amount of the powdered cocoa on top. 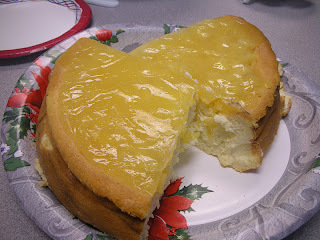 The cake part did really seem to be lady fingers but was fine. It was not soaked in the requisite amaretto that really adds a little punch but that is to be expected from a commercial product. We're used to more cocoa powder but this is resectable! All in all this was good but our champ's position remains unchallenged! 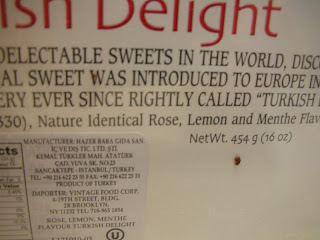 Today we encountered yet another kind of Turkish Delights. 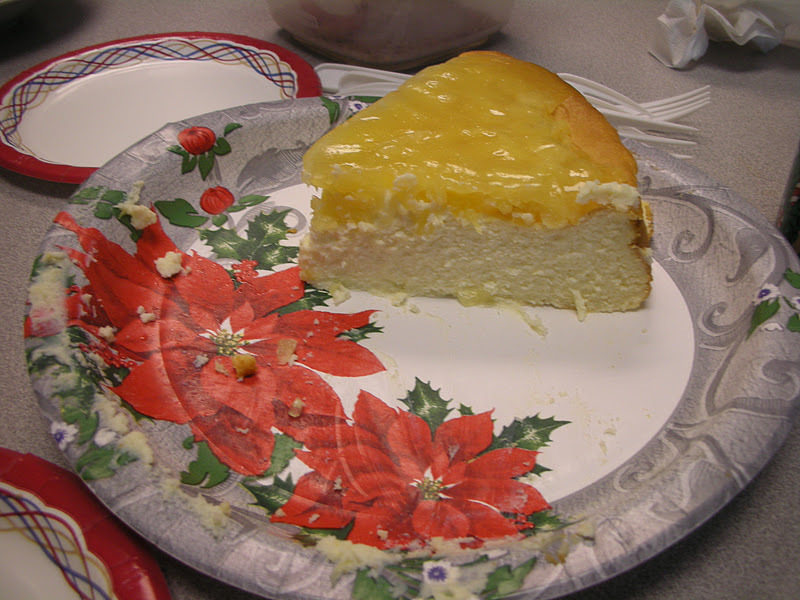 Apparently this was a gift handed off to one of our physicians who promptly donated it to the cake hour cause. 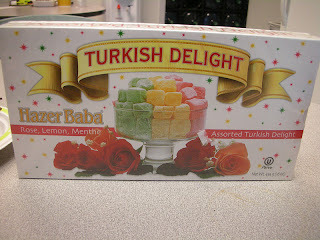 Everyone should know by now what Turkish delights are. We have seen a lot of them. 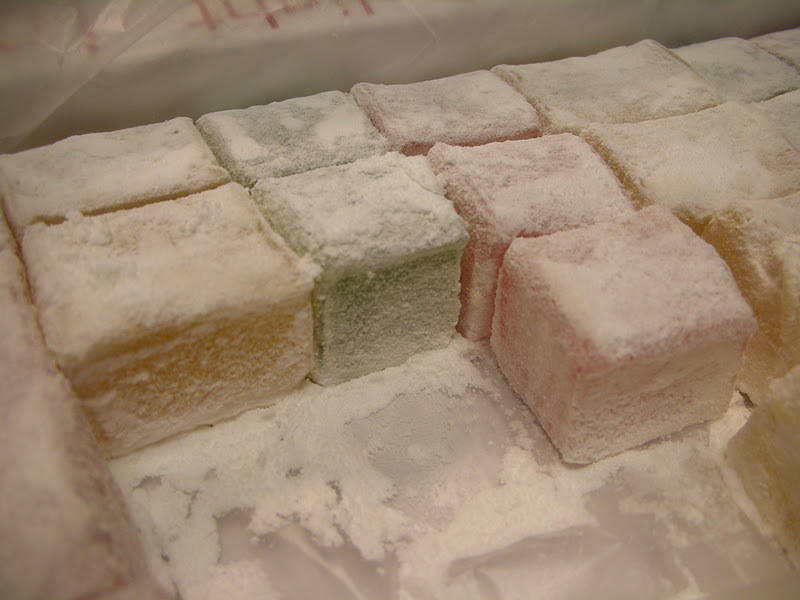 They are basically gelatin squares with some kind of flavoring and might include pistachio nuts or coconut.They are then buried in powdered sugar. 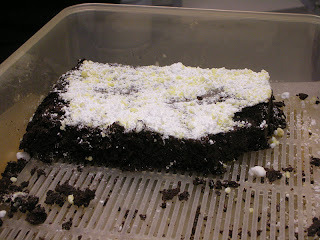 A classic presentation..in neat rows with powdered sugar on top! The additional fun with these was that they combined to be the classic Christmas colors - red, green and gold. This added a bit of festivity given the season that we are in. 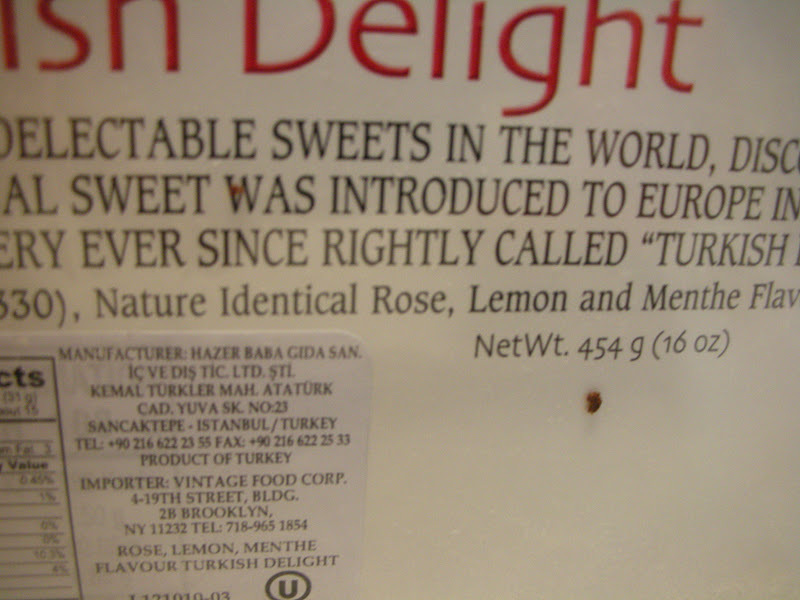 We are also happy that the ingredients are all natural or at least that what we take the "Nature Identical Rose Lemon and Menthe Flavors" on the back to mean. 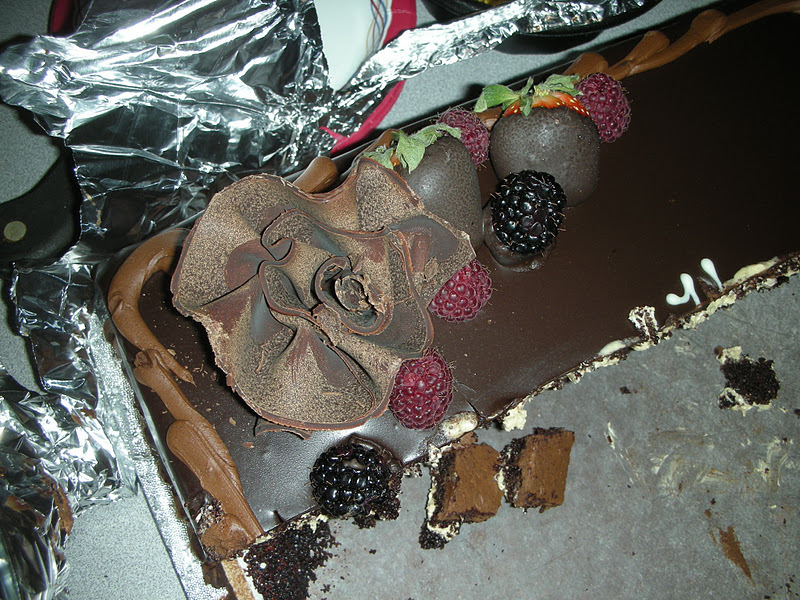 Found in the refrigerator also was the final piece of the Opera torte from our holiday party. Good as this cake is mercifully this will be the end of it! Last night was the Holiday Party for the Division of Gastroenterology. 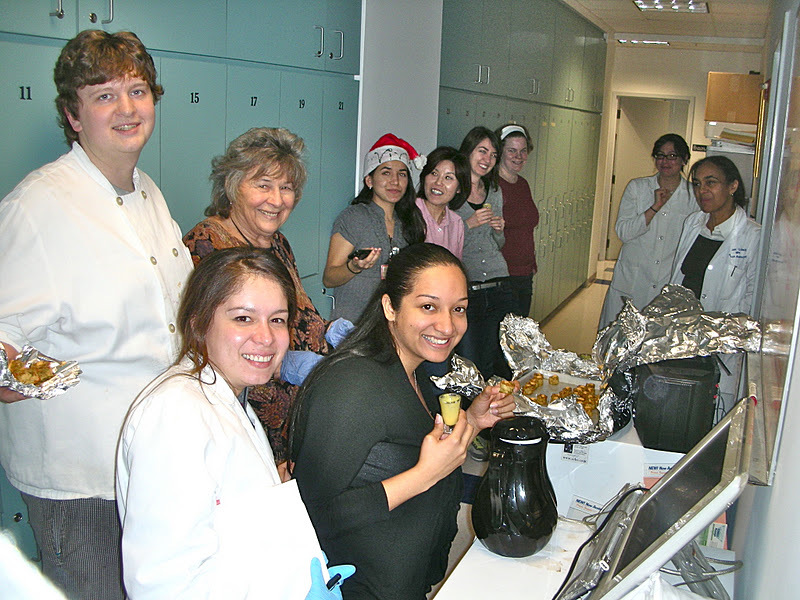 It is held a the CAV restaurant and usually involves a lot of food and one huge cake. 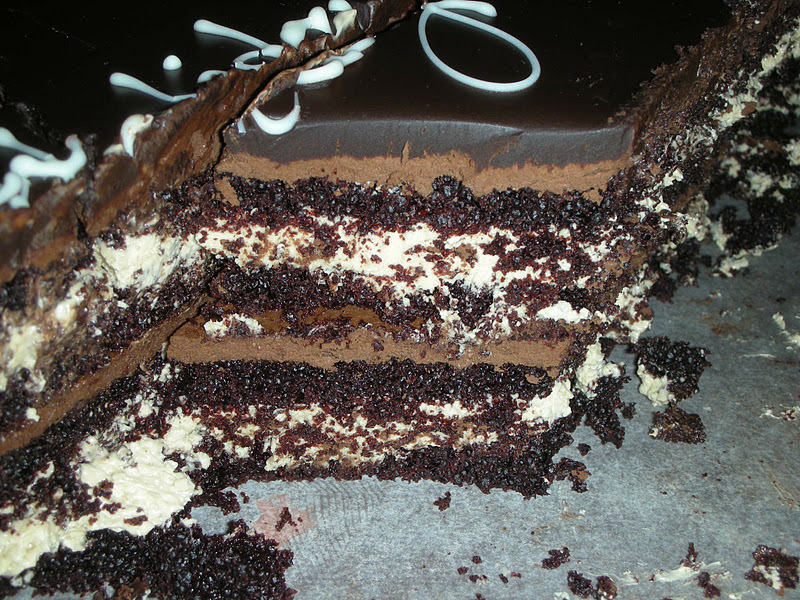 The cake is an Opera Torte intended to feed about 150 people. So it is humangous. Probably because everyone has already pigged out on all the other food the cake never gets totally eaten. 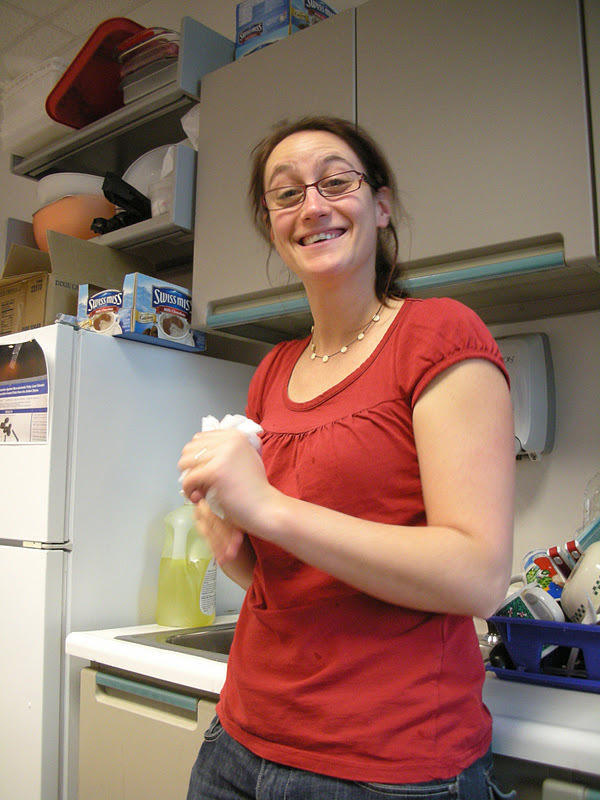 So we get to pick up the remainders and have a go at it at cake hour the next day. The cake before the first cut! This cake is very good and is quite a creation. 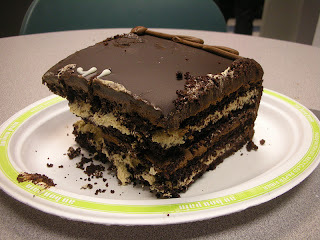 There are about five layers and in between them there is either frosting or come kind of milk chocolate mousse. It is then topped with more mousse and then a very rich but very delicious chocolate ganache or similar. 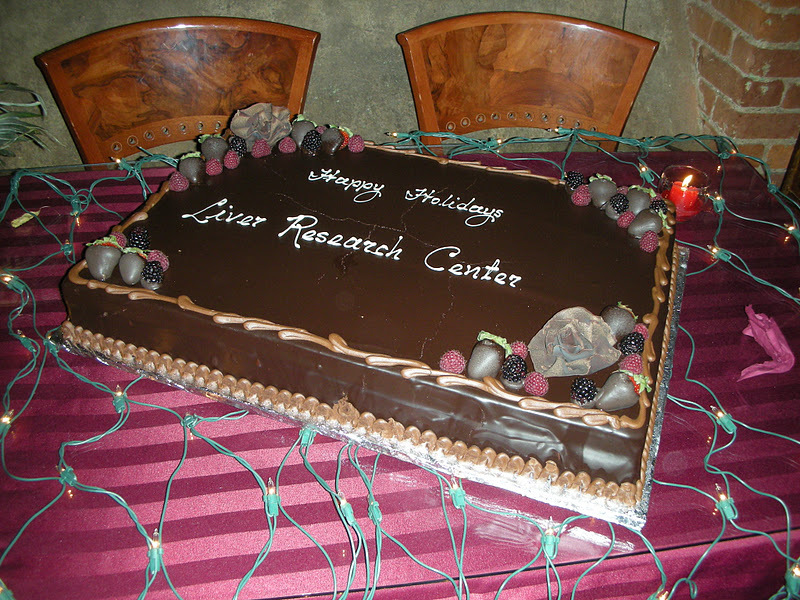 As dessert for the holiday party with a glass of champagne it really makes an impression. The next day in the light it tastes good but one realizes pretty quickly that a large piece won't do. In fact most people had a small portion and enough was left behind to continue for a few more days. If you want a good chocolate cake to feed the masses - this is what you are looking for! It's the rest of the cake - and still a pretty large chunk of it! Chocolate rose and chocolate covered berries.. The strawberries are seriously dunked! It's good but two people tried and could not finish the corner piece! We also had a French treat to supplement the cake. Nougats Tendres Assortis! Assorted tender nougats! 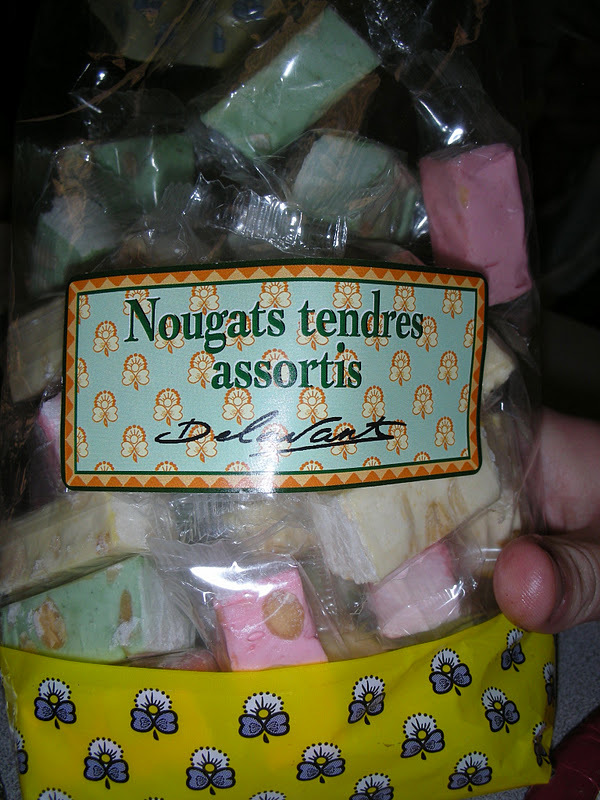 A colleague's parents were in town from Lyon, France and brought some nougat. This is a little bit like Bit O'Honey. 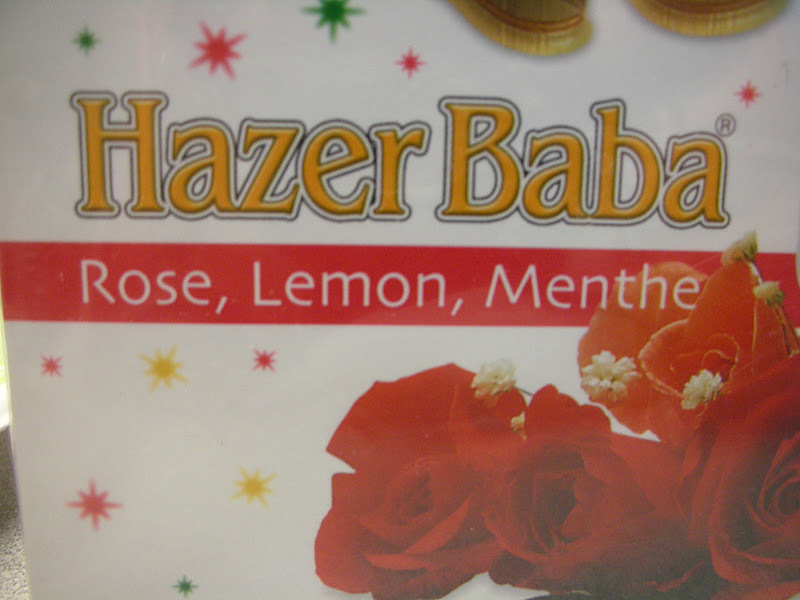 There were several flavors and they were good but nothing to blowy your mind. 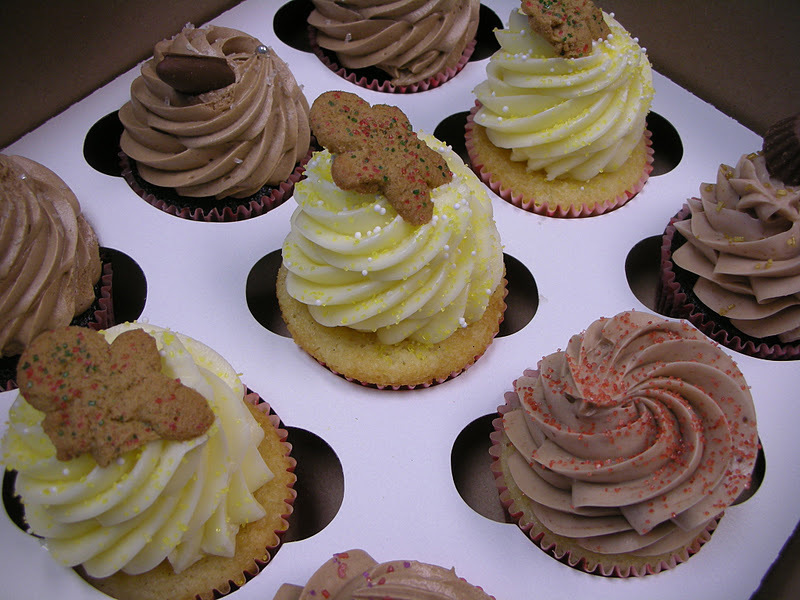 The cupcake craze continues. The nice thing is that these businesses seem to spring up here and there and at the very least give you an option in the event that you need to get something for an unexpected occasion. Today we were celebrating a birthday and needed to get something nearby as the provider has been without daily transportation since the other half got a job and now commands the car. 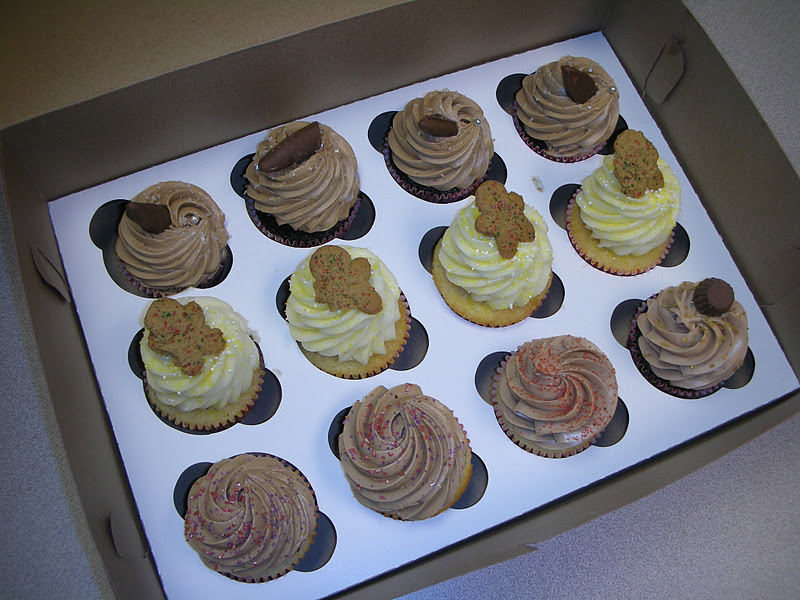 Not one cake but a dozen cupcakes! It seems like a lot of frosting, no? Fortunately City Girl Cupcakes has set up shop on Weybosset Street in downtown PVD. Since this was walkable we were able to get a dozen cupcakes in lieu of an appropriate birthday cake. 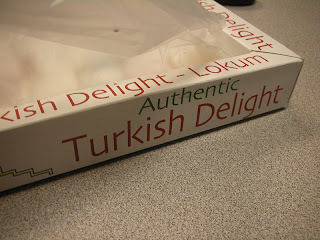 We had actually tried them before but didn't finish the post. Although we got a dozen there were basically four different kinds. We looked at the menu we had previously gotten and could not really tell which we were dealing with. Suffice it to say one was chocolate with a chocolate frosting, another was white with frosting and a cute mini gingerbread man on top. 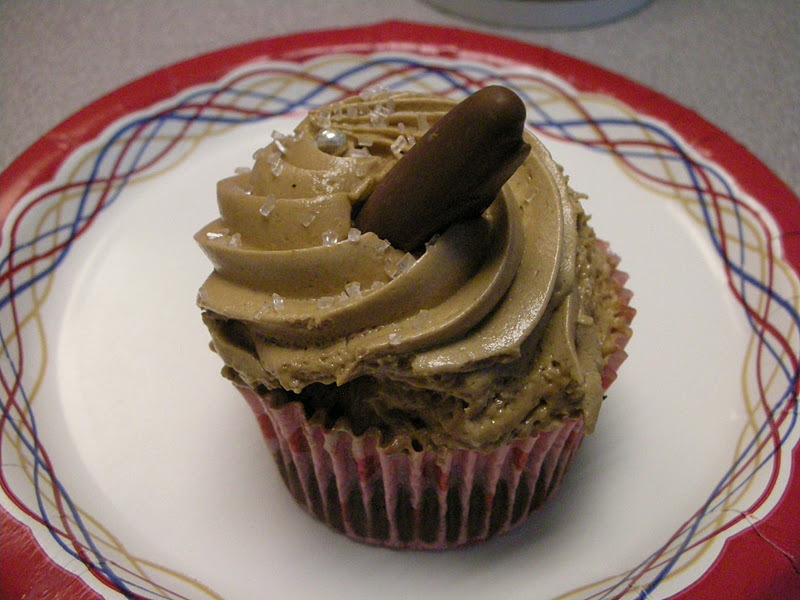 There was a single cupcake that was chocolate and peanut butter and lastly another group of golden cupcakes with maybe a mocha frosting. A cupcake for my birthday...formidable! 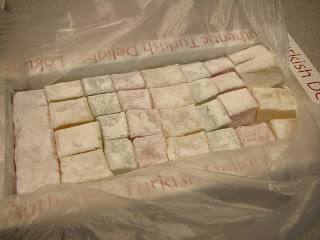 They were all good and moist though there seemed to be a preference for the chocolate ones. 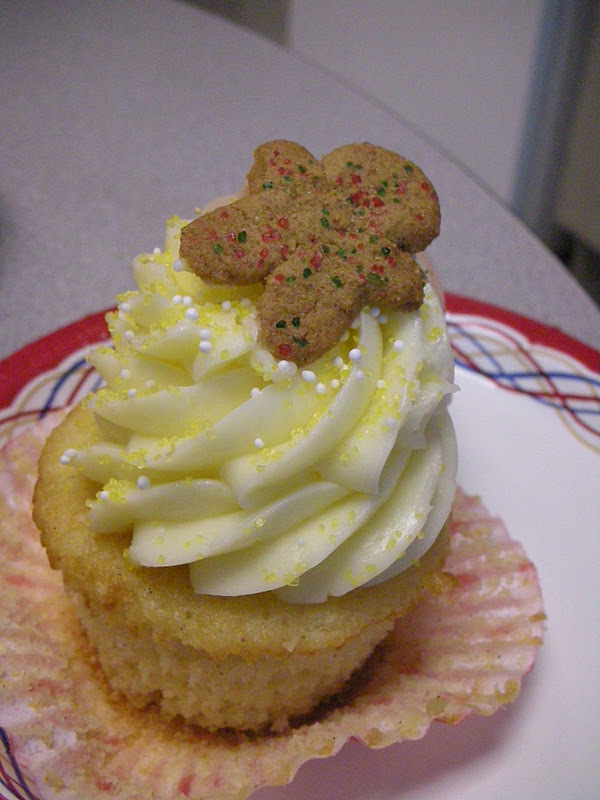 The good thing about these cupcakes that are being made everywhere now is that the frosting is always lighter than it looks. Frequently when you see one of these things and see the size of the dollop of frosting you are reluctant to try it imagining that the frosting is going to be this lardy fatty over-sweetened gunk. 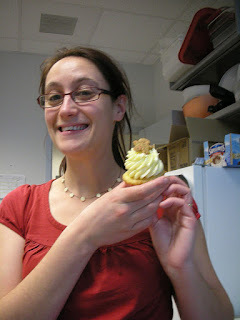 But surprise, most of the time the frosting is much lighter and therefore is easier to take. It may be part of the reason that this craze has caught on because sometimes the frosting is where all the flavor lies. 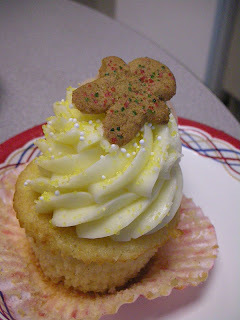 Cute little gingerbread boy riding the frosting surf! 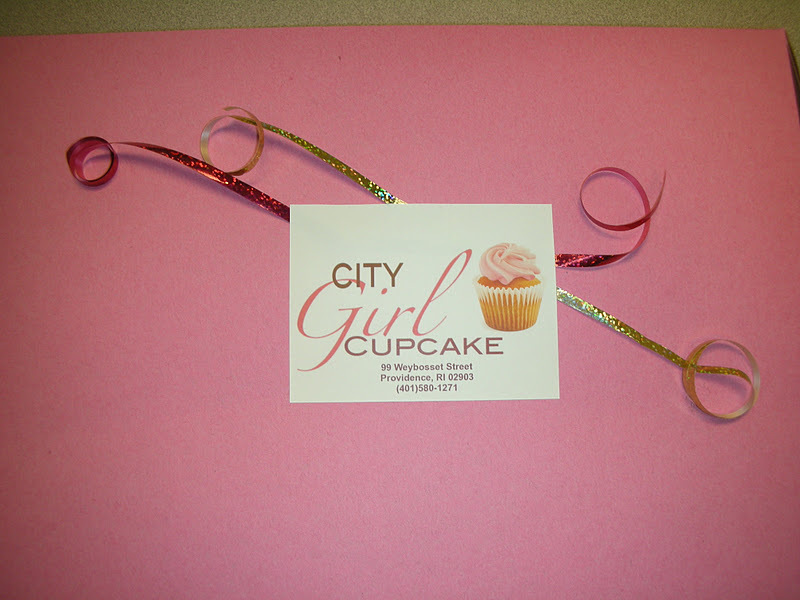 Our city girl was happy to sample some City Girl Cupcakes and we were glad we could offer her some sweets on her natal day!